Welcome to ThaiFoodLa.com! 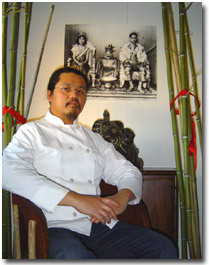 Paul Butpet, owner of the Melanee Thai restaurant has been serving delicious Thai food to Los Angeles since 2001. Inspired by his childhood experiences in Thailand with his mother's cooking, Paul brings some of the most delicious and creative Thai dishes to be found in all of Los Angeles! Have a look at Paul Butpet's history and learn more about his unique cooking style as well as how he became interested in becoming a Thai chef. Paul has taken some mouth watering Thai Cuisine Photos - have a look!  Order Delivery or Have Us Cater Your Event!  Get a 15% discount on your next visit! If you are feeling adventurous take a look at our Thai Recipes page or have a look at our Thai Resources page for more information on the rich history and culture of Thailand. Come on by for some delicious Thai Food and say hello to Paul. When it comes to Thai Cuisine, Paul has something special in store for you! For directions and contact information please click here. Given 4 out of 4 stars! Only 2 restaurants given such an honor out of hundreds! We Cater & Deliver Too!